So, you think that you’re living a life that doesn’t impact the environment that much but actually, how clued up are you? 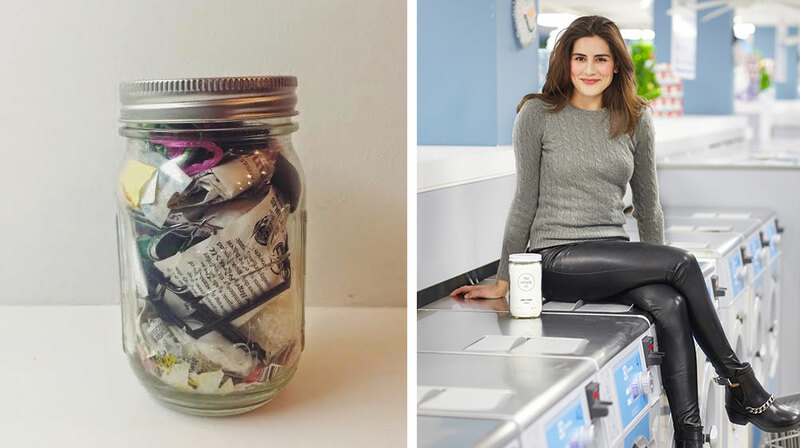 New Yorker, Lauren Singer, promotes living a zero-waste lifestyle through her blog Trash is for Tossers and her trash for 4 years fits into a 500 ml mason jar. How about yours? It’s 7h00, your alarm goes off, you hop out of bed and into the shower. Your shower gel is about to finish, so you squeeze out the last few drops and throw the plastic bottle in the bin. Next, you’re out of the shower, and after brushing your teeth, you make a note to buy more toothpaste. And deodorant. These are all products that we use daily, but where do these empty bottles, packets and tubes go once we’ve discarded them? The answer is landfill, where they sit for a minimum of 450 years until they break down. 450 years. Let that sink in. And this excess isn’t exclusive to the bathroom. Think of the coffee cup you bought this morning’s brew in. Was it single use? Well, once it goes to a landfill, it will most likely never break down, due to the way some landfills are built. Look at picking up that takeaway sandwich for lunch, your packet of crisps, even your beer bottles – these are things that we consume extremely high levels of and they are literally sent off to a dump to pollute our earth forever. New York native, Lauren Singer, promotes awareness around environmental impact through her blog Trash is for Tossers. As a high school student she became fascinated with environmental studies and specifically became aware of the negative impact that humans have on the environment through their consumption. She continued with these studies at college, immersing herself in complete enviro-warrior activism. She was present at protests and lobbied against oil and gas companies who are destroying the planet. Lauren believed that she was doing all that she could for the earth until one fateful day. While in class, she watched a fellow environmental student take their lunch out of a plastic bag, eat from a plastic container, using plastic cutlery, and then simply dump everything in the bin. Lauren was horrified, plastic is a direct byproduct of the oil and gas companies that she had devoted so much time protesting against. She couldn’t believe that someone could cause so much waste, and so carelessly. Angered, she went home to open her own fridge and saw that the state of plastics and packaging in there was not much better. Be it her fridge, her cleaning products, her makeup and clothes, everything around her contained some form of plastic packaging. It was then, that she committed not only to reducing her waste but eliminating it completely. 4 years. It's been an incredible journey and I know I've done something that I believe in when these piles look huge to me! Nothing better than living your values. The overhauling process was a methodical one. Like all habits, Lauren had to break her routine of relying on plastic in her life. As packaged products like toothpaste and deodorant ran out, Lauren had to find plastic-free alternatives. To her shock, there weren’t any. So she got online and found recipes to make her own. Through this journey of filtering out the single-use packaging in her home, she found it easier to move to a completely zero-waste lifestyle. What does zero-waste actually mean? It means that every product is reused or recycled, that she never uses plastic and that nothing is sent to a landfill, and where necessary she will compost. WHAT DOES LAUREN’S ZERO WASTE DAY LOOK LIKE? Well, in all honesty, not that different from yours. Except that Lauren is using homemade (and chemical-free) toothpaste, biodegradable bamboo toothbrushes, a reusable coffee cup (nothing is getting in the way of this coffee addict’s caffeine fix!) and lunches packed in glass jars or tiffin-style stainless steel lunch boxes. She says no to plastic straws, receipts and plastic shopping bags. By committing herself to reusing and recycling, Lauren managed to fit two years of her trash into a 16 oz (nearly 500 ml) glass jar and hasn’t sent a single item of waste to a landfill since 2012. What is really the most impressive thing about Lauren Singer and her lifestyle is that at face value it seems so challenging to live waste-free, when in fact, all it requires is awareness and consciousness. There’s also something much more civilised about eating out of glass or ceramic than from a plastic container or polystyrene. Being an environmentalist and someone who is concerned about protecting the environment is no easy task. There are offensive labels that you’re plastered with – treehugger, hippy, eco-nut. But Lauren Singer does away with all those preconceived ideas. She’s a young, stylish 20-something, living her best life in New York. She buys second-hand clothing, and when it comes to groceries, she buys loose ingredients in bulk and most fresh produce from farmer’s markets. When asked what the most difficult part of this journey was, Lauren simply replied with “nothing”. For her, it’s about how you approach the subject. She has never once felt lacking, or left wanting; there is nothing to be lost (but for excess waste) and there’s everything to gain. That’s possibly the best thing about Lauren, she’s fiery, stubborn, and will fight for what she believes in, but ultimately she’s kind and engaging. She wants to inspire people to embark on a less-impactful journey and will take the time to help anyone who needs it. Her advice for the average person who wants to reduce their waste? Find one thing, regardless of how big or small it is, and commit to that. Be it asking for no straw in your drink, not taking a plastic lid for your coffee or even starting to recycle, just start small. Your awareness will soon begin to spread to other aspects of your life. This concept of wanting to educate and help people make a difference turned out to inspire Lauren to open her own company, The Simply Co. The company sells handmade organic, vegan cleaning products packaged in reusable and recyclable glass, with screen printed labels. Screen printed because any glass with a regular sticker or label goes straight to landfill. Once she embarked on zero-waste and was forgoing commercial cleaning products and detergents because of the packaging, she explored what was actually in these products that we rely on so heavily. In short, chemicals. Lots and lots of undisclosed (due to American laws that don’t enforce transparent ingredient labelling) chemicals. Knowing that she didn’t want the plastic, or the toxins, in her life, she turned to making her own household cleaning goods through immense research. Followers of her popular blog were converts, but for various reasons, some struggled to make their own products. Working with the belief that everyone deserves safe products, she opened The Simply Co. so that she could provide people with access to these cleaning items. Lauren Singer is truly an inspiration. In an age where we can have anything and everything we want at any time of the day, where excess is the norm, she is an example of how simple life can be. And she aligns her beliefs with her own environment, in a city. Here she is, a hustling New Yorker who makes no impact on planet earth. If she can do it in such a large metropolis, so can we all. You don’t need to be living out in the country to live mindfully. However, as big an impact as she makes, you won’t find her lecturing or shaming anyone into this way of life. She believes in people trying their best to do what they can. She doesn’t want people to beat themselves up if they forget a reusable shopping bag on one of their grocery runs and have to buy plastic, they’re still doing more than most by trying to remember in the first place. Lauren has found the ultimate reward, not only by reducing her impact on the planet but by finding a way to live in line with her morals. She’s found that it’s helped to eat better (fewer impulse purchases because nearly everything is packaged), save money (as she’s buying most items in bulk) and generally living a clutter-free, clean life. Through The Simply Co., she’s looking to inspire and help people all over the world and is eventually going to expand to international sales. Lauren, with wisdom far beyond her years, makes this lifestyle completely achievable. You just have to change your approach. If you’re a person who recycles, eats ethically-sourced meat and organic vegetables, then you’re already something of an enlightened, conscious individual. And while going 100% waste-free may not be what you’re ready for just yet, you’re certainly in a space to consider at least recycling and reusing. Take Lauren’s advice, and find just one small change you’re going to make, implement that and see what path that takes you on. You may just surprise yourself. Start with small changes like eliminating single-use plastics for example, then, check out Lauren’s YouTube channel for more ideas. Here’s one to get you started.